This article focuses on the operation of WirelessHART as transmission protocol in the field of process control with decentral controllers for systems with small time constants compared to the wireless transmission period between sensors and actuators. 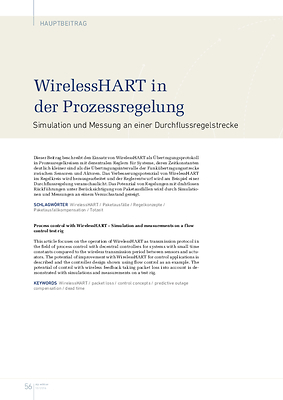 The potential of improvement with WirelessHART for control applications is described and the controller design shown using flow control as an example. The potential of control with wireless feedback taking packet loss into account is demonstrated with simulations and measurements on a test rig.